Labong is a Tagalog word for Bamboo Shoots, an edible part of the bamboo which is used in different Asian dishes. These shoot or sprout for those who do not know, are the new bamboo stems that just came out from the ground. While this recipe had more bamboo shoots than meat, it still had this meaty taste to it, making this one a good way to minimize the meat intake. 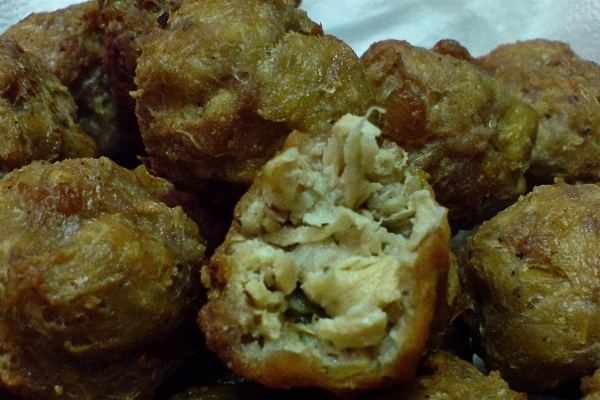 One thing you'll notice though, the balls can be a little too chewy, so it's best to serve this with some soup. 1 Prepare the bamboo shoots. Chop it depending on your preference. 2 Next, boil the bamboo shoots for about 30 minutes, drain and allow it to cool. When already cool, squeeze out excess water. Best to do this hours before you cook your meatballs, or maybe the night before. 3 Prepare the meatballs. Loosen up the shreds of bamboo shoots and add everything in - seasoned ground pork or longganisa, egg, oyster sauce, flour or cornstarch, salt and pepper. Mix everything until all ingredients are well incorporated. 4 Heat a pan with a little oil and fry a pinch of the mixture and taste it. Adjust the seasoning of your meatballs mix if needed, then shape mixture into balls. 5 Deep fry the balls until golden brown and drain on paper towels. Serve hot with ketchup.